Mary Tang wrote me today to share a Chinese translation of my poem “For Tomas Transtromer.” For more information about my call for translations of this work, see the Translate This Poem page. On the composition of the translation, Mary writes, “My translation of your poem from English to Chinese was spontaneous and took little time. To me some poems translate themselves into Chinese; other can never be.” Find out more about Mary on her site here. Thanks Mary! This entry was posted in Poetry, Translations and tagged Tomas Transtromer, translation on April 12, 2015 by Jeff Schwaner. the strange west, where descending evening colors the ocean’s every drop. unsheathed, our demons striving to materialize out of the dark cluster? with a word, or a wave across your zither, can turn the knife’s edge back into night. [Note: This is the most recent draft of a work based on a poem of Mei Yao-ch’en (1002-1060), about whom I have written many poems on this blog. The first version can be found here. The three between that draft and this one were too incomplete to share, so I’m sparing you those. My continuing thanks to Chen Zhang, Chinese Literary Preceptor at Harvard University, for her explication and patience. She not only provided a word-for-word translation but important historical and critical perspective that helped me locate this work closer to the heart of Mei’s writing; she also provided her own enthusiasm for this specific poem. Sitting alone with a cup of coffee a few days ago in a Panera Bread with a marvelous view of the twilight saturating the Blue Ridge, I found a way into this poem through the voice of the poet I have appropriated/channeled/imitated in nearly forty other poems that were not attempting to be translations. That voice I was so used to writing in already helped me re-imagine this most recent version, which I think may be closer to a true translation of my friend Sheng-yu’s work. Again, the idea to approach the poem that way came from Chen, who pinpointed so well the difference between interpretation and translation in my many amateur’s questions. 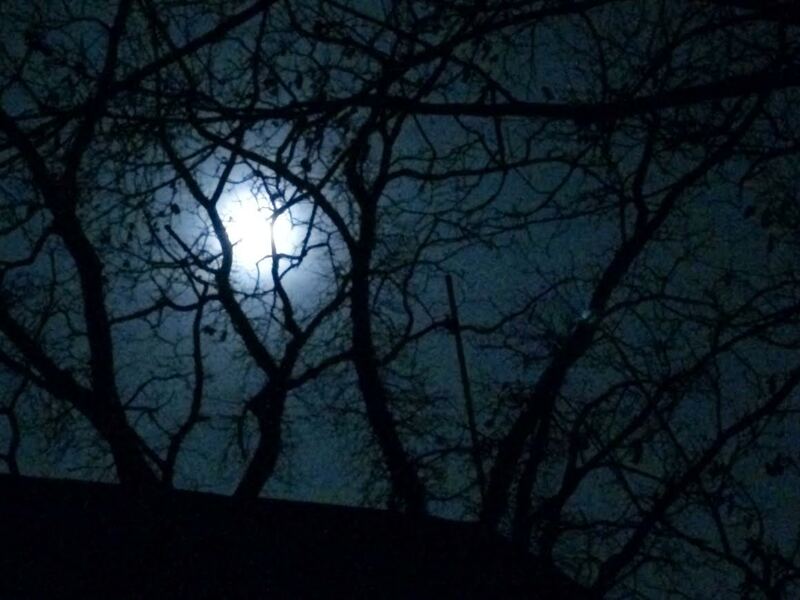 This entry was posted in New Writing, Poetry, Translations and tagged classical chinese poetry, demons, lunar eclipse, Mei Yao-Ch'en, night, poetry, Ruan Ji, Sheng-yu, Sung dynasty, that one:many thing Archie always used to write about, translation, zither on March 23, 2015 by Jeff Schwaner. That line from Mr Wine gave me an idea. I know many of this site’s readers are also writers and poets; and many of you visit here from lands quite far-away from the Blue Ridge mountains here in Virginia—from China, from Turkey, from Manila, from Spain and Italy and even from Boston, where I know from experience the English language is just a little bit different… So why don’t you take a shot at translating this poem into your own native language? If it creates one more reader of Tranströmer as a result, you’ll have done a great deed. And I’m curious, from a somewhat philosophical perspective as a writer, what the problems and rewards are of translating one of my own works into another language. I’ll put up a new page on the site’s banner where any new translations can be posted and compiled, and would like to hear from any intrepid souls who attempt this exactly what the experience was like. I know the poem itself, as well-meaning as it is, is much more a stone than a full moon; but seeing it translated into Swedish, and knowing that it reached its intended audience, made it shine a little bit brighter to me. My great thanks and appreciation to James Wine, not only for bringing this poem to Mr Tranströmer’s attention, but also for providing his translation for me to post here. This entry was posted in Favorite Poets, Poetry, Translations and tagged astor piazzolla, Baltics, fellini, for tomas transtromer, James Wine, poetry, pynchon, swedish translation, Tomas Transtromer, translated poetry, Translations, transtromer, unregulated verse on February 8, 2015 by Jeff Schwaner. I will be checking out this rather cool topic in my rather cool and little city this weekend. Angela Carter and Stan Galloway are area poets whose work I have enjoyed hearing in person. 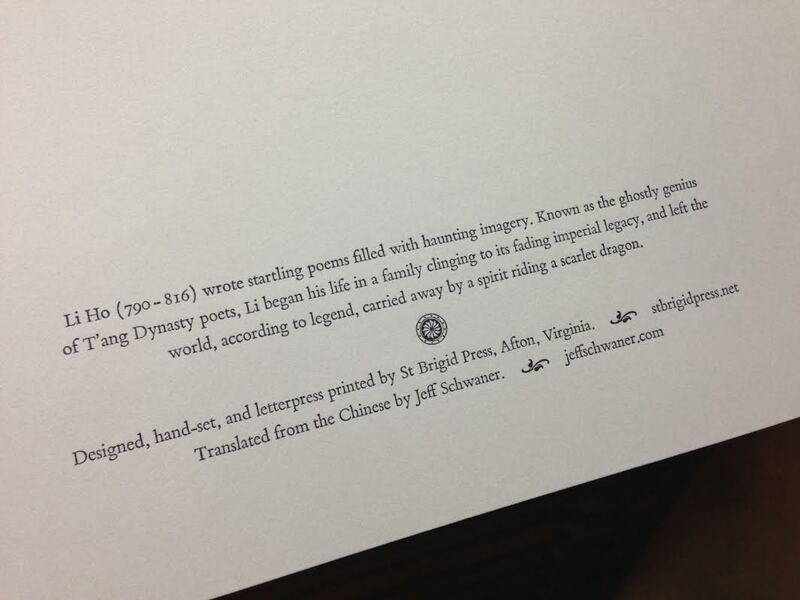 Printer extraordinaire Emily Hancock of St Brigid Press will also be bringing copies of the mini-broadside of my translation of Li Ho’s “Sky Dream” for the event. I will not be selling this myself and I’m not sure if Emily has it for sale yet on her site, but you can always write her if you’re interested in seeing more. 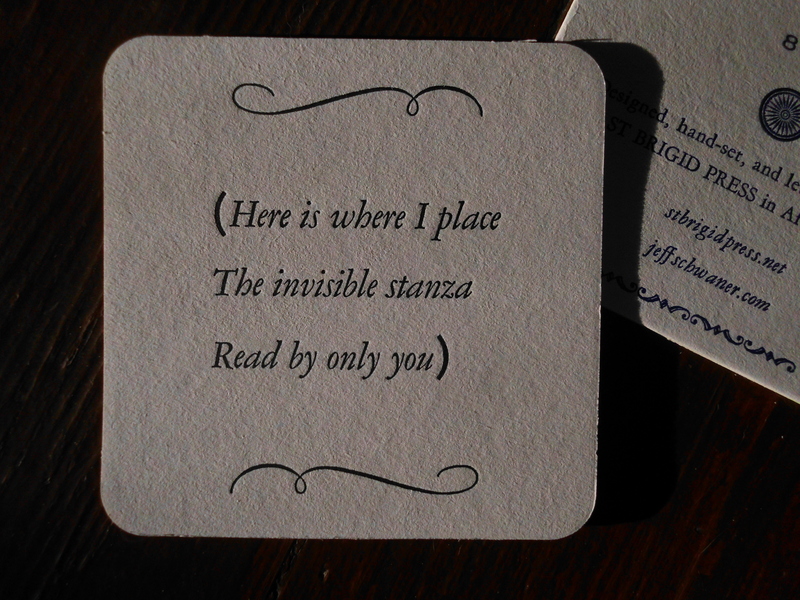 The poem is printed on very thin Unryu paper backed by grey Magnani Pescia paper, in Bembo typeface. 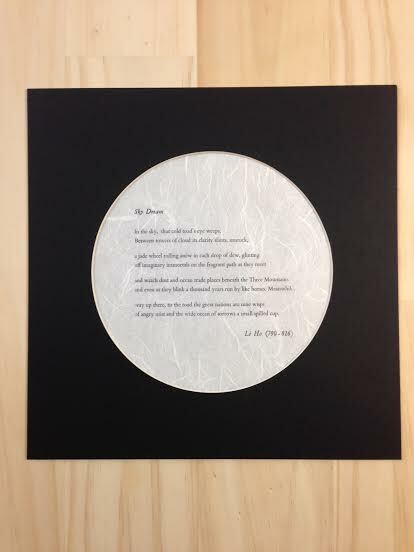 The matting creates the shape of the moon which of course our poet Li would not bother to name in his brilliant and strange piece of verse, and will I think be available in a variety of night-sky-ish colors. 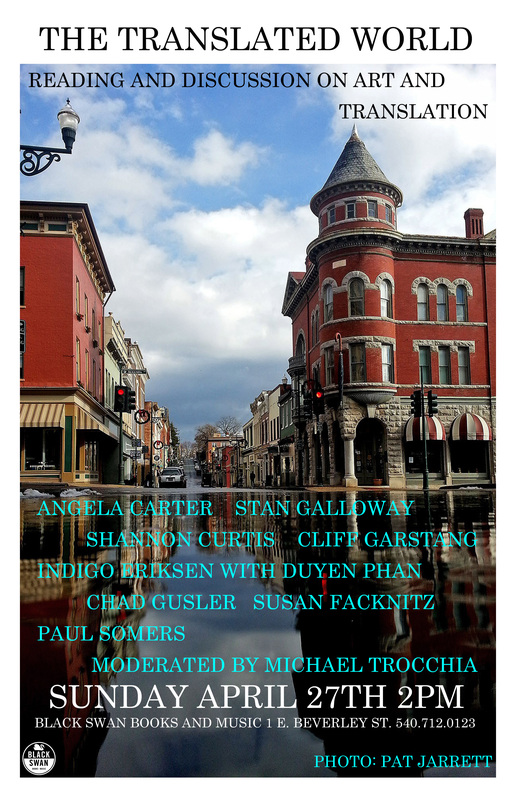 This entry was posted in Book Design, Poetry, Projects, The Drift, Translations and tagged Angela Carter, black swan, classical chinese poetry, haiku, li ho, Mei Yao-Ch'en, not haiku, poetry, regulated verse, Stan Galloway, Staunton, translation on April 26, 2014 by Jeff Schwaner. First you find a quiet place in the forest near a mountain. You set about clearing a small patch of land, building a house, moving a family in from the other side of the world, naturally they are confused at first, until you show them that everything is where it should be, including the dragon behind the falling water and beneath the icy pool and the distant dragon in the mountain and the fox behind the tombstone they cannot read and the toad on the moon and the orioles in the tree, and you set about showing them you have built the house where a breeze from the south protects against the red dust of the paths which led them here, and then you set about taking in the family’s exiles, who naturally drink more wine than anyone else yet seem not to have the same sense of vertigo upon arrival, because the moon is the same and has always been the same moon and one day when you are out looking for one of them who did not come home last night you find a plant growing on the dusty path and take it home, and when you get there the exiles are waiting wondering where you were and if there is any more wine, and then you set about placing the perfect plant in a window on the top floor that the family loves and the forest around it loves and that sounds as the last needle of sun skims the canopy of trees and glances off the window like the sound like rain on bamboo. And in the leaves of that plant the past of each of the house’s denizens has to be taken into account, and in every flower a future extending a thousand years. And then you turn your back on it as you turn your back on a dream upon waking, it has to melt back into the earth, artificial as it is, without causing harm. And the fox comes around looking for the garbage and in the middle of a clearing is the poem. This entry was posted in New Writing, Poetry, The Drift, Translations and tagged chinese poetry, haiku, literature, not haiku, poetry, prose poetry, Schwaner, translating, Translations, unregulated verse on February 8, 2014 by Jeff Schwaner.